The internet landscape has changed dramatically from 2008 to 2013—smartphones and tablets came into existence, countless new websites popped up, and internet access across the country rose 10 percent. But, when it comes to our most basic surfing habits on home desktop computers, we’ve remained largely unchanged, according to a working paper commissioned by the National Bureau of Economic Research. Turns out that old habits die hard, and the data reveal that the number of sites we visit and how long we spend on them has remained pretty stable. The research only looks at primary home computer usage, using data collected by ComScore, rather than the rapidly growing sector of “alternate” devices like tablets and smartphones. Since they started collecting data, these two newfangled devices grew to account for 60 percent of all the digital media time spent in the U.S. Yet, even with that huge addition, the amount of time spent by users on primary home devices (the computer on the desk in the living room) didn’t see any more than a slight decline between 2008 and 2013: about one hour less per week, on average. 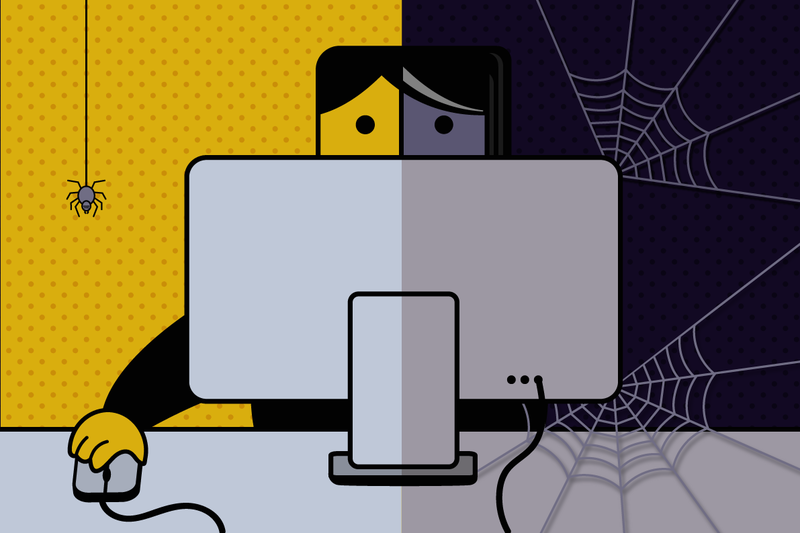 One trend that stayed largely the same was the “breadth and depth” of web browsing, meaning that people spent about the same amount of time browsing roughly the same number of different sites. “Dwelling,” or the weekly fraction of sites of which visitors spent at least 10 minutes on, remained largely unchanged. Despite the fact that overall habits didn’t seem to change all that much, there was a significant change in the sites where time was most readily spent. Just think—MySpace was in its heyday in 2008. In the five years following, the number of social media and online video sites increased dramatically, with Facebook and Reddit taking the place of the once-great platform as it slid into obscurity. 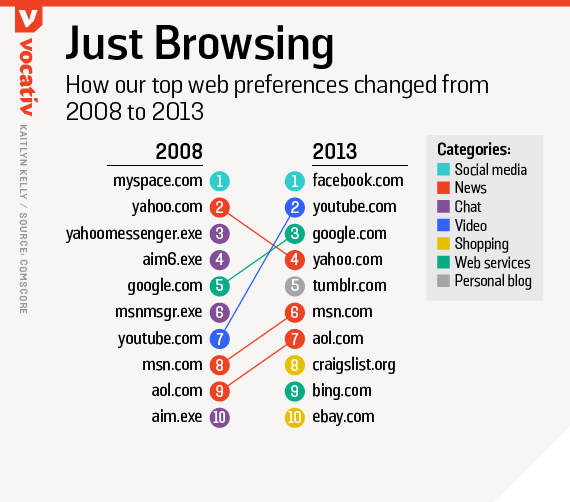 These sites also largely replaced desktop-based chat platforms like Yahoo Messenger, AOL Instant Messenger, and MSN Messenger. Another key takeaway from the report is that socioeconomic factors have continued to play a notable role in how the internet is used. 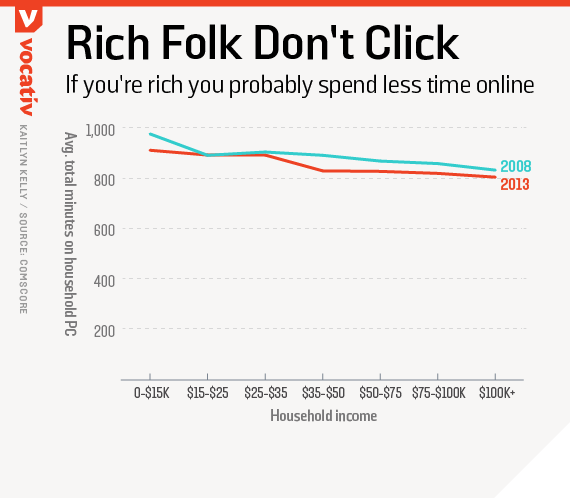 Higher income households spend, on average, less time on the internet per week than households with lower incomes. Households with a six-figure income spent 92 less minutes per week online than those on the other end of the spectrum: households making between $25,000 and $35,000. Online attention is then what economists call an inferior good—something that decreases in demand when consumer income rises, like White Castle burgers. People who have more money have better options for how to spend their time. That group also happens to be the people with the most disposable income, hence they are the holy grail for advertisers, online and off. So this finding poses a quandary. “The implication for advertisers might be that when you’re getting a lot of repeat traffic, odds are it’s coming from a low-income user rather than a high-income user, that you might only be able to get one crack at because they are online a little bit left,” Boik said. There’s also a noticeable divide in how demographics affect the type of sites Internet users are spending their time on. Those living in higher-income households spend more time visiting sites that center around things like credit history, online banking, shopping, and video services. The data is limited. 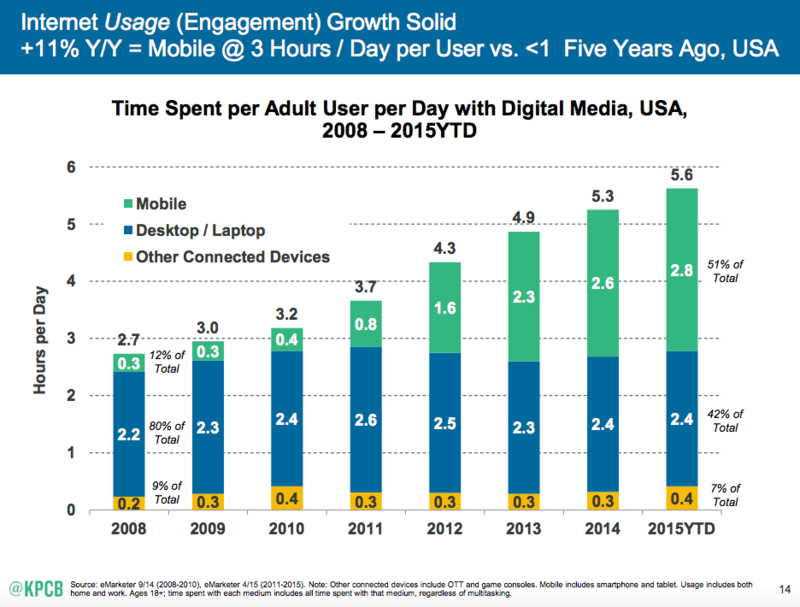 It ends at the end of 2013, and because it’s home computers only, it doesn’t take into account the huge surge in mobile audiences. Young users, specifically young, affluent users are now online almost exclusively on their phones. It also misses a nice neat circle, in that chat apps, albeit chat apps baked into social platforms, are back in Vogue. Snapchat, Whatsapp and Wechat have supplanted AIM and Aol Messenger, and because they’re now also vehicles for advertising, money-sharing and transactions. The biggest takeaway from the expansive report, which covers five pivotal years in the online economy, is that we have shown that we have finite internet appetites for content via laptops and desktops. Pair that with analyses like Mary Meeker’s annual “State of the Internet” report and you’ll see that all the internet growth is on mobile, while time on other machines stays static. If you want to draw a conclusion from this, it’s that if you’re in the internet content game, the only place you’re likely to find new users is on their mobile phones. But if you’re in the internet content game and you didn’t already know that, well, power down your big ol’ desktop tower PC and go home.
. But, when it comes to our most basic surfing habits on home desktop computers, we’ve remained largely unchanged, according to a working paper commissioned by the National Bureau of Economic Research. Turns out that old habits die hard, and the data reveal that the number of sites we visit and how long we spend on them has remained pretty stable.